I try to think ahead. 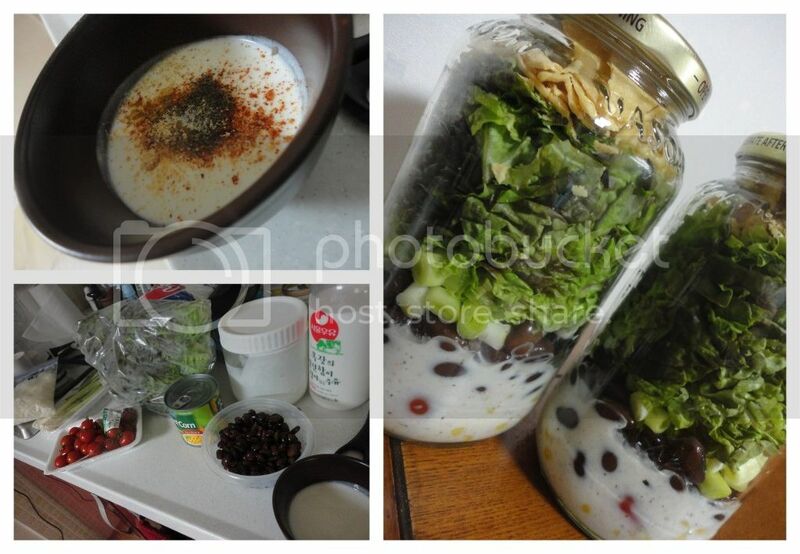 We had some obligations coming up, so I opted to throw together some Mason Jar Salads and see how they worked out. They were quite delicious. I may have needed a bit more dressing, and a bit more space at the top for easier shaking, otherwise - it was a nice dinner and seems like a promising picnic option...time to get into our car and enjoy some road trips! The basics of Mason Jar Salads are to layer up starting with dressing, a hearty set of veggies, cheese and finally lettuce. For this Taco Salad, I started with a yogurt dressing which I threw together - essentially plain, home-made yogurt with chili powder, cayenne powder, salt, pepper and cumin. (Sour Cream and Salsa would work equally well, if not better for a taco salad). Next, I threw in some corn, followed by tomatoes and black beans. Once those items were layered in, I tore some lettuce into the jar and finally placed some tortilla chip crumbs on the very top. When the dinner hour rolled around, the hubs and I got some exercise shaking our jars and enjoyed some salad (except Mike doesn't really like corn, so he didn't enjoy his as much).